[Workington] ... has a good harbour, and an extensive trade in coal, from the valuable collieries of Henry Curwen, Esq., and several other collieries, many of which are at a considerable distance. 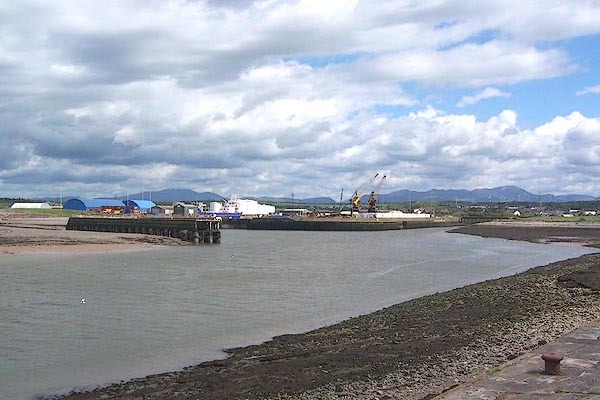 "On the west side of Darwent is a pretty creke, whereas shyppes come to where ys a pretty litle fisher town called Wyrkenton, ..."
In Workington Harbour there is thirteen feet at high-water with ordinary spring-tides, and seven or eight with neap-tides. When there are eight feet of water in this Harbour, colours are hoisted in the day, and a lighted lanthorn hung by a rope at night, on the starboard hand goning in, about two ships-length from the channel. To sail into Workington Harbour; keep about two cables-length from the edge of the sea, until the lanthorn bears about S.E. then steer right for it; from thence steer E. into the Harbour. Workington distinguished at Sea. / Workington may be distinguished at sea by How-michael Hill, which has a small tower on the top of it, and stands about half a mile south-westward of the Harbour's-mouth. There was a proposal some years ago for deepening the water in the entry of this harbour, and making it more commodious to sail out of it than it was with certain winds then; by extending the pier-head eastward, and the basket-work on the E. side of the entry, north-westward. I have not yet learned whether this has been carried into execution. Label at the Derwent mouth. Print, uncoloured engraving, Workington, Cumberland, drawn by W H Bartlett, engraved by R Wallis, published 1840s. Probably from Findens Views of the Ports, Harbours, Coast Scenery, and Watering Places of Great Britain, as continued by W H Bartlett. Rules, printed sheet, Abstract of Rules and Laws for Workington Harbour, or Port of Workington, Cumberland, published by the trustees, 24 March 1791. Guide book, Jollie's Cumberland Guide and Directory, published by Francis Jollie and Sons, Carlisle, Cumberland, 1811. Chart, Position of all the Lighthouses in the British Isles, scale about 38 nautical miles to 1 inch, published by J and A Walker, 72 South Castle Street, Liverpool, Lancashire, 1842. 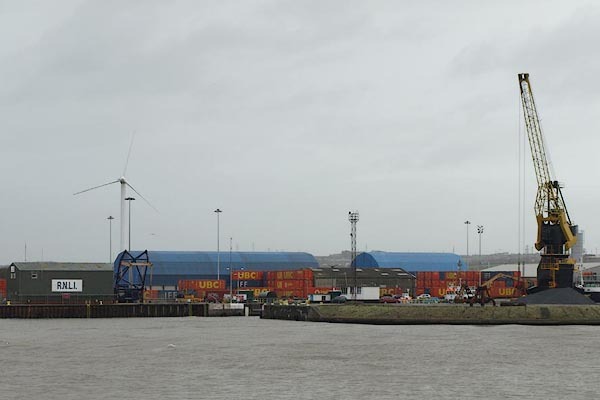 A train was in the port loading containers onto container wagons at Prince of Wales Dock. Old building, some sort of port office? on the road out to the John Pier.